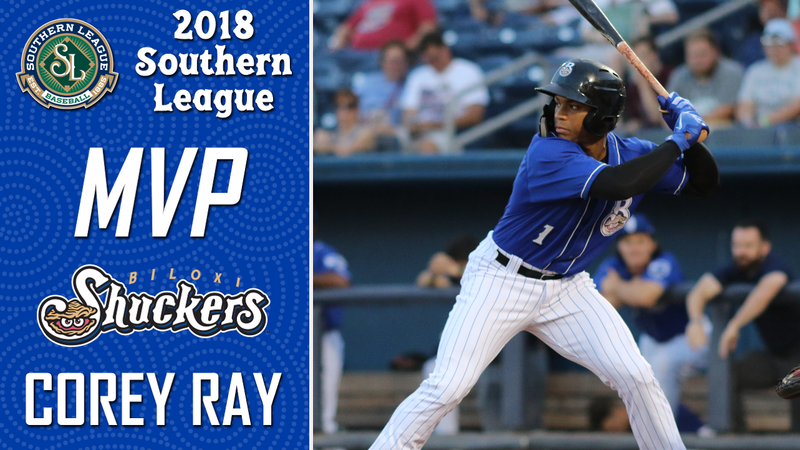 Biloxi Shuckers outfielder Corey Ray has been voted the 2018 Southern League Most Valuable Player. He is the first Shuckers player to win the award in the four years of the franchise. Ray joins Zack Brown and Manager Mike Guerrero in completing the major awards sweep after Brown earned Most Outstanding Pitcher and Guerrero took home Manager of the Year. As of Wednesday, the Milwaukee Brewers' #2 prospect paces the league in Home Runs (27), Stolen Bases (35), Games Played (130), At-Bats (513), Doubles (32), Extra-Base Hits (66), Slugging Percentage (.485) and Total Bases (249) while also ranking second in RBI (73) and Runs Scored (83). Ray provided several memorable moments throughout the season, but his month of July went down as the best offensive month in the Southern League in 2018. Ray finished the month slashing .282/.333/.628/.961 with 11 home runs, 27 RBI, 25 runs scored, eight doubles and 13 stolen bases. His 11 home runs and 20 extra-base hits were the most in Minor League Baseball during the month of July. In July, Ray also provided a three-homer game on the 11th against the Jackson Generals. It was the first time a Shuckers player has hit three home runs in a game at MGM Park. Four days later, Ray stole a career-high four bases in Jacksonville against the Jumbo Shrimp. On the July 22, Ray torched the Tennessee Smokies with a pair of doubles and a home run. From July 19 to July 28, Ray collected at least one extra-base hit in eight of ten games. Ray's most electric moments arguably came at the beginning of the year. On April 12, Ray amassed a career-high five RBI, including a bases-loaded double in the eighth inning, as part of a 6-5 win over the Mississippi Braves. He also notched five-RBI for a second time two days before his three-homer game in July. Ray provided the MGM Park faithful with their first of eight walk-off wins on May 3 against the Jumbo Shrimp. Down 2-1 in the ninth, Ray drilled a two-run home run to right to win the game. Of his 27 home runs this year, nine of them came in leadoff fashion (1st inning home run, batting first) to jumpstart the game for the Shuckers offensively. Ray brought his leadoff prowess to everyone's attention when he hit a leadoff home run on three consecutive days from May 15-17 against the Pensacola Blue Wahoos and Chattanooga Lookouts. Ray and the rest of the Shuckers are home for the final five games of the regular season beginning on Thursday night. The Shuckers then stay in Biloxi for Games One and Two of their South Division Championship Series matchup next Wednesday and Thursday nights at 6:35 PM CT at MGM Park. Single game tickets for the Biloxi Shuckers 2018 season can be purchased at the MGM Park box office or over the phone through Ticketmaster at (800) 745-3000. Playoff tickets and group outings are also available and can be reserved by calling 228-233-3465 or visiting www.biloxishuckers.com. The Biloxi Shuckers are the Double-A Affiliate of the Milwaukee Brewers. The Shuckers play at MGM Park in Biloxi, Mississippi. For more information please visit biloxishuckers.com and follow us on Twitter @biloxishuckers and at facebook.com/biloxishuckers.com.